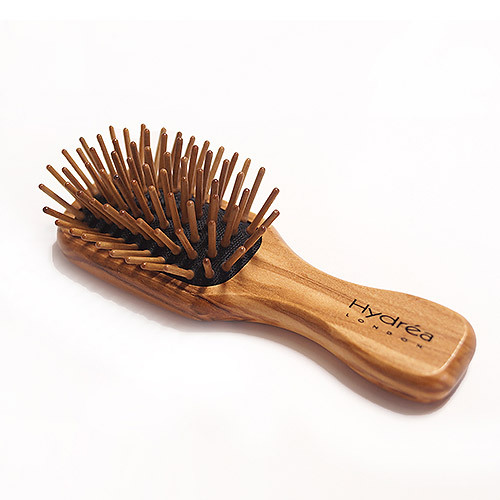 Hydrea`s Travel-sized hair brush is perfect for styling on the move. This Olive Wood Hair Brush is carved from strong Mediterranean Olive wood, using wood from trees that are no longer bearing fruit. This eco-friendly, ergonomically designed, durable and premium quality hair brush makes a wonderful gift that oozes luxury with its distinctive Olive wood grain. No two brushes are alike. The rounded olive wood styling pins are set in a pneumatic rubber cushion and penetrate deeper than a regular brush providing a stimulating scalp massage. Perfect for gently detangling hair while preventing static build up. To clean the brush, run a comb through the bristles to loosen any particles. Wash with shampoo then air dry with the bristles facing down. Below are reviews of Olive Wood Travel Hair Brush with Anti-Static Pins by bodykind customers. If you have tried this product we'd love to hear what you think so please leave a review.